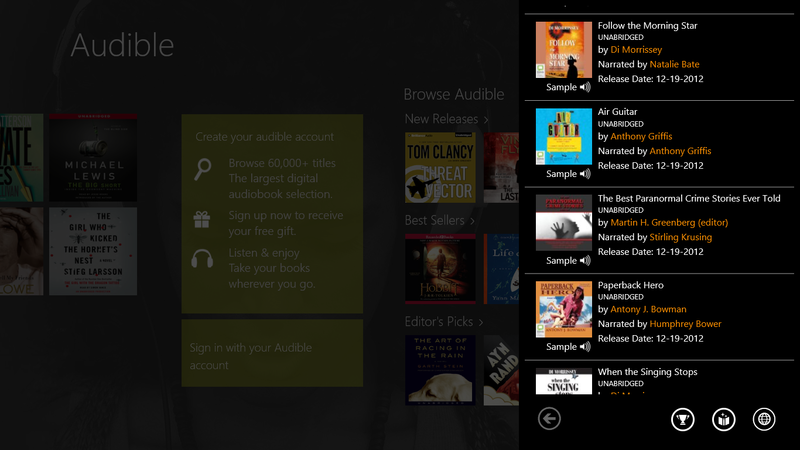 It took the longest time for the Audible app to hit Windows Phone after its initial launch but it seems Amazon has got their act together rather more quickly for Windows 8. The app is of course available for Windows Phone too so many of you may already be familiar with the service. 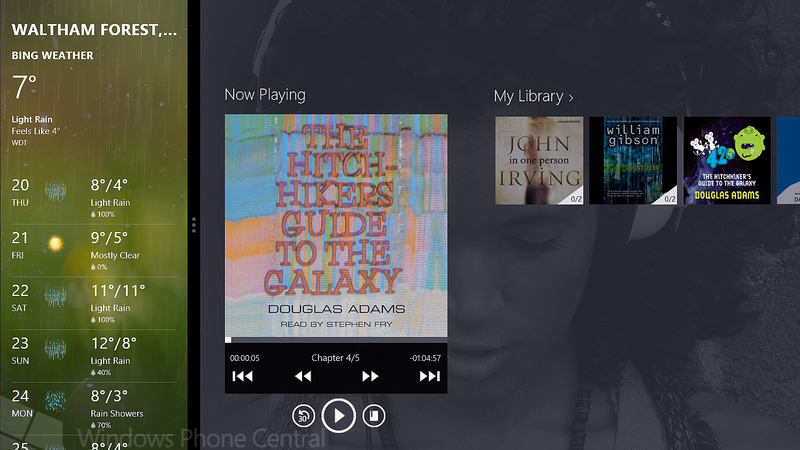 Audible operates predominantly and most economically on a subscription based model. You pay a fee each month and can use credits to purchase new books, simple. 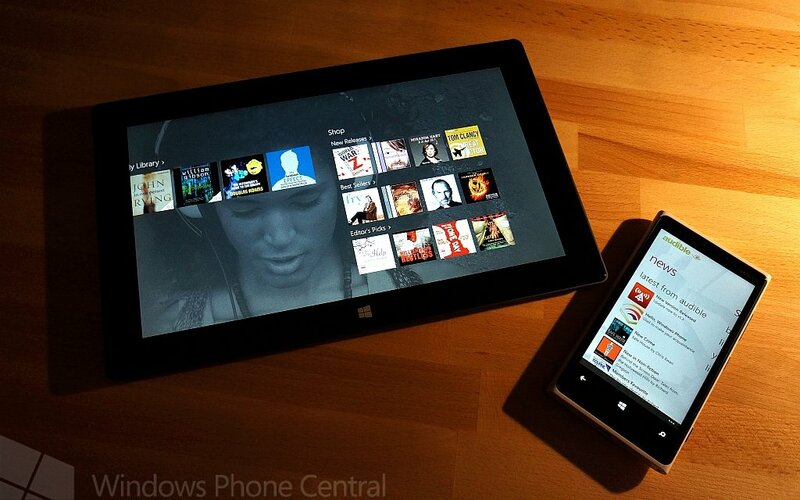 So how does the Windows 8 app stack up? We take a quick look. The app is free to download but you will need to sign up for an account just like all the other versions or if you just want to look about they let you in without one. Once that’s done simply download the app and sign in, if you are an existing customer all of your books will be presented to you in ‘My Library’. You then have the option to download the books to your machine. Installation is quick and painless, and as mentioned before you only need to sign in to get things up and running. To test the app I have been using it on the 32GB Surface and as expected it runs very smoothly. The app has a nice snapped view where you can select to view either your library or the essential ‘now playing’ screen with the play controls. It's convenient to leave it snapped there when you’re busy doing something else. On a few occasions I have noticed that when I stop playing the book and go away and come back to the app it has an issue continuing on. This could just be down to my setup but it is worth noting. Otherwise the normal task of quitting the app and restarting will allow you to carry on where you left off and that is the most important part of the whole endeavour. You can browse the marketplace from within the app but this is basically just a window into the web store. That is fine but one can’t help more could be done here to bring the experience into line with how the app looks rather than simply looking like a part of the web browser bolted on. As a first generation app it’s looking very good and certainly does what it says on the tin. It plays back your audio books. 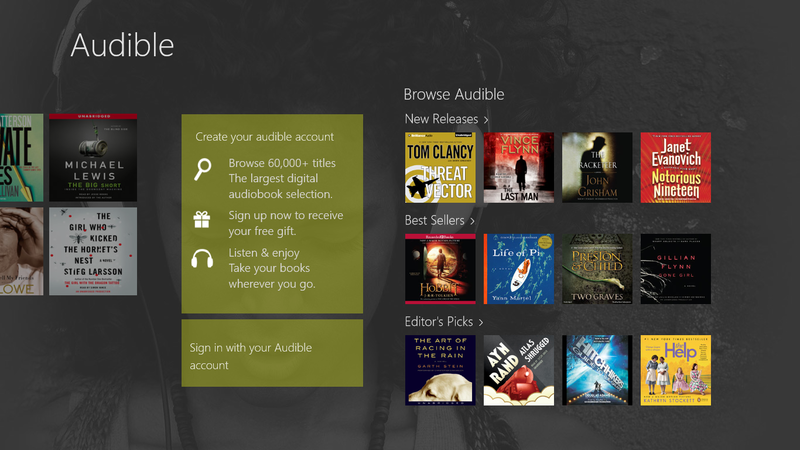 As a special promotion, new customers who sign up to the service on Windows 8 will be eligible for a free copy of the critically acclaimed Life of Pi. Not a bad offer to get things started but if you do miss out Audible generally have other offers here and there to entice you in. Good to see Amazon continuing to make sure their content is made available on as many devices and platforms as possible. The Windows 8 and Windows Phone 8 apps are a marked improvement over what we have seen from them in the past and we hope it signals an uptick in development efforts.